As East Texas rebuilds after Hurricane Harvey, three IAM Districts and three Local Lodges have banded together to help make life a little easier for residents in hard-hit areas of Houston. 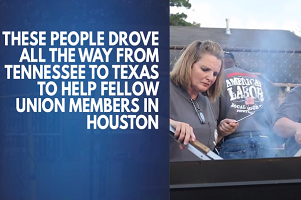 Moved by the images of destruction and the needs of those impacted by the floodwaters, IAM Local 2385 in Fayetteville, Tennessee, began organizing a more than 1200-mile round trip to Houston to cook meals for impacted communities. IAM District 711 immediately began assisting the effort, and together the two organizations then started coordinating with IAM activists in Houston. Once in Houston, Local 2385 and District 711 set up a staging area in the parking lot of the Texas Gulf Coast Area Labor Federation, where they were soon joined by Houston’s IAM Locals 811 and 2198. Together, the groups cooked and delivered more than 750 meals to area labor unions, FEMA relief centers and religious institutions who then provided them to individual communities. IAM District 141 Vice President, Victor Hernandez and Winpisinger Center Instructor, Jorge Bonilla, both residents of Houston, also helped organize the effort and deliver the meals. Click here to watch a video of their efforts. Hundreds of IAM members from Texas and Florida have already applied for disaster relief and IAM Representatives have begun hand-delivering checks to them.